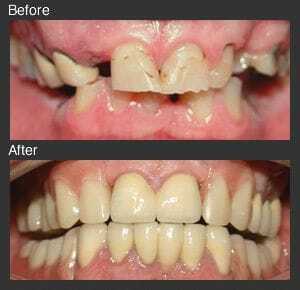 A smile makeover is a way of ensuring that you have the confidence to look great and feel great. The first thing you notice about somebody when they talk or smile, is their teeth. Chipped, discoloured, crowded, spaced or missing teeth significantly affect your smile and the first impression you make on people you meet. A cosmetic smile makeover may be whitening your teeth with Zoom!, it could involve replacing your old silver fillings or it may be a full mouth restoration using implants and veneers. Smile makeovers are not just something for the rich and famous, they are often an inexpensive and simple way of improving your smile. Brides will normally spend several thousand dollars on their wedding photos - why not spend a few hundred before your wedding so your photos look fantastic and your teeth don't spoil precious memories. Talk to one of the clinical team from Anzac Avenue Dental during your next visit to find out what we can do for you and your smile. Have a look at some of our smile makeover successes with Ellie, Andy, Gail, Elizabeth, Hanna, Holly, Jane, Kerry, Kristy, Nikki, Pete, Sandy, Theresa, Tina, Veronica and Wendy or go to our 'gallery' page for more before and after photos. "Thank you for giving me a new smile. Not only have you given me this, you have given me a new confidence that I haven't had for a long while. Thank you for your kindness, it's actually been a pleasure to come to the dentist with your warm, friendly staff and your generosity". Take the smile test to see whether a smile make over might be suitable for you. Click here to read our education brochure that discusses a range of cosmetic options available. Please be aware that any surgical or invasive procedure carries risks. Before proceeding, you should seek a second opinion from an appropriately qualified health practitioner.